Wisconsin is popularly known as America’s Dairyland, but, in fact, its overall economy is largely based in manufacturing. This sector dates back to the early 20th century when European immigrants relocated to the state. Curt G. Joa, a young German engineer, was one of them. In 1935 he established a manufacturing company in Sheboygan Falls, WI. His genius was designing and patenting an automated process to produce sanitary paper products previously handmade. Today, Curt G. Joa, Inc. is one of the world’s leading manufacturers of machinery for the production of disposable paper products. Through its dedication to engineering and innovation especially using 3D printing it maintains a competitive edge for some of the biggest consumer sanitary product manufacturers. In 2009, Joa began designing a system that could produce paper products faster than any other machines on the market. One critical component within this new design was a large round vacuum forming tool capable of spinning at high speeds creating a centrifugal force pulling layers of material together to form the product. The “drum” needed to be lightweight for speed but also incredibly strong to handle the torque and pressure of the vacuum. Since the drum was going into a demanding end-use application, the material also had to meet strength requirements. Traditionally, the company machined this type of component from aluminum or stainless steel with a wire mesh mold. However, expected demand did not allow for long leads times of CNC machining, die cutting and welding. An even bigger issue was the inability of stainless steel and aluminum to handle the speed and torque of the new system. The third challenge was customization at reasonable cost and lead time. The vacuum forming drum was critical because it would allow customers to design and create tailored sanitary products. Customization would give Curt G. Joa a huge advantage over competitors who take a one size fits all approach. Curt G. Joa’s design engineers had used additive manufacturing for prototyping in the past and immediately identified the vacuum forming component as an ideal candidate to leverage the design freedom available with technology. They chose to design the parts for Fused Deposition Modeling (FDM) for its ability to create a complex geometry in ABS-M30 engineering-grade thermoplastic. FDM also uses soluble support materials extruded simultaneously with the actual model material and washed away in a sodium hydroxide bath after the part is built. 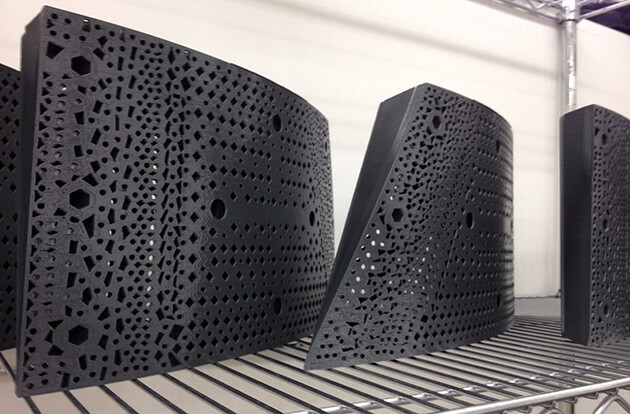 “The soluble support material really opened the doors for getting creative and building complex, organic shape with many holes and channels to maximize airflow,” said Eric Quittem, Supervisor of Project Engineering at Stratasys Direct Manufacturing. Furthermore, the part could be built in one piece, minimizing assembly time and optimizing strength. Curt G. Joa’s engineering team started prototyping various design concepts on the Stratasys Fortus 900mcs in the research and development lab. Access to machines in-house allowed the team to rapidly prototype, test parts and bring this product to market faster. “Having FDM systems in-house is very convenient for our team. We can update CAD files, print out a new prototype and test it on the actual machine all in the same day,” said Tony Smith, Purchasing Manager at Curt G. Joa. The team continued making modifications and strengthening parts until they landed on an initial design and started moving into production with vacuum forming tools. The FDM systems in-house are primarily dedicated to prototyping and testing new designs. To customize vacuum forming tools for customers they needed a partner with a fleet of FDM machines who could rapidly deliver parts. The team turned to the manufacturing services provider Stratasys Direct Manufacturing which operates nearly 200 FDM machines. “We chose to work with Stratasys Direct Manufacturing because they have a strong background in the technology and have the capacity to produce our parts on demand,” said Smith. Stratasys Direct Manufacturing has produced end-use vacuum forming drums for Curt G. Joa throughout the last 3 years. With FDM services, Curt G. Joa produces a unique one-piece design which would be impossible through other manufacturing methods. The FDM ABS thermoplastic meets strength requirements, while the porous nature of the FDM layering process lends itself well to the vacuum forming component for additional airflow. In addition to excellent mechanical properties, FDM aided Joa in providing custom products for each of its customers. “3D printing has allowed us to get closer to our customers and help them throughout their own product development process because we can recommend design changes or modifications that we weren’t able to before,” said Smith.